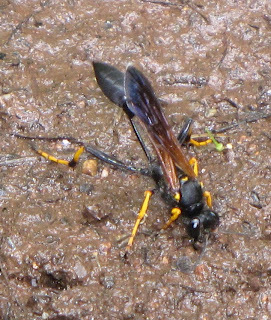 Few wasps in North America are as ubiquitous and conspicuous as the familiar Black and Yellow Mud Dauber, Sceliphron caementarium. 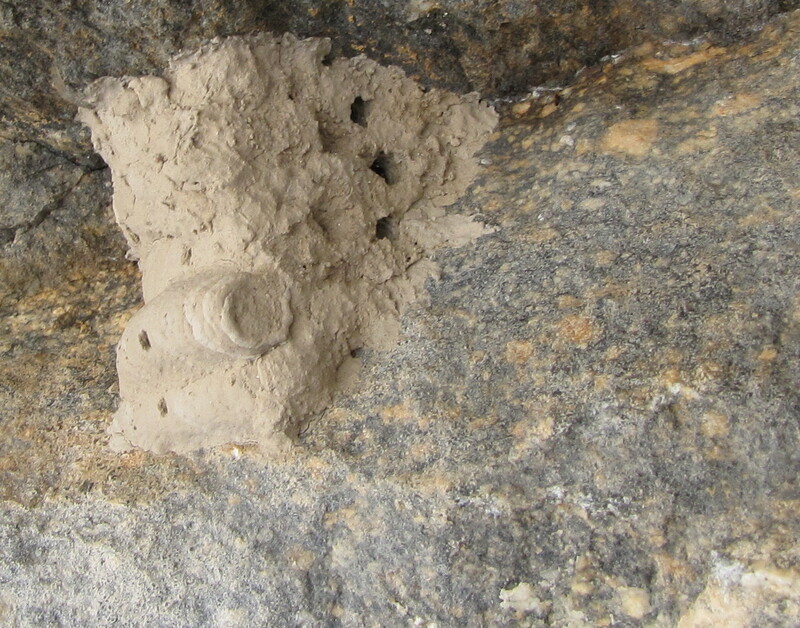 Even when the wasps themselves are not obvious, their mud nests are often are. 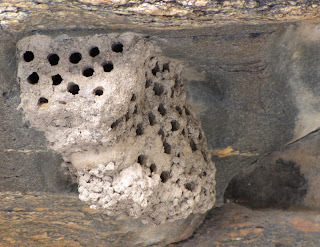 Homeowners consider the amorphous clod-like nests to be eyesores, if not a hazard when the female wasp is at work on one. 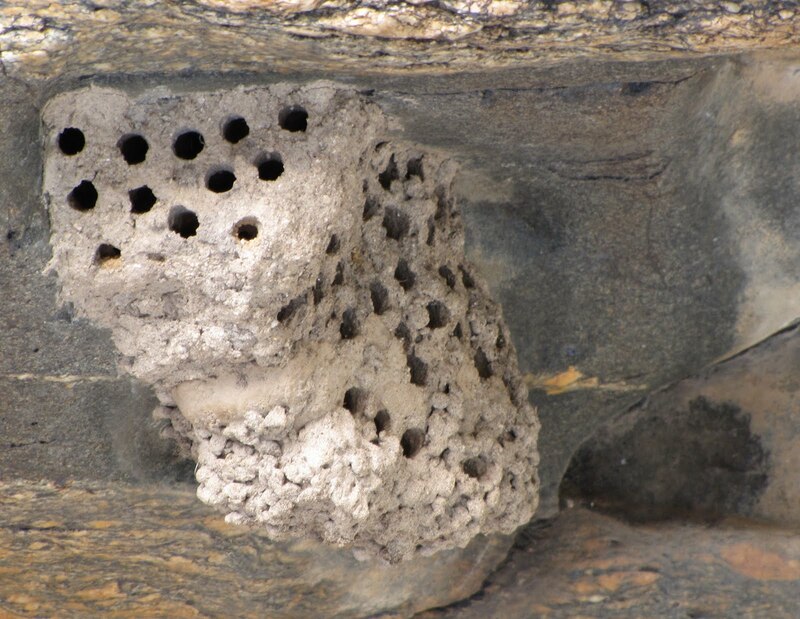 Take a closer look, and you will be amazed by the wasp and her legacy of insect lodging. Sceliphron caementarium has an extraordinarily widespread geographic distribution, and varies markedly in its appearance from north to south. Northern specimens tend to be mostly black, with dark, violaceous wings. Western specimens tend to be more yellow, with yellow wings. Not only does this species occur from Canada to Central America and Peru, it has been introduced to the West Indies, Bermuda, Hawaii, the Marshall Islands, Cook Islands, Society Islands, New Caledonia, Australia, Fiji, Samoa, France, and Germany. Once again, international commerce has played a role in the wasp’s seemingly jet-setting lifestyle. Females may build nests inside of shipping containers that then make landfall at various ports. Why does the Black and Yellow Mud Dauber succeed wherever it finds itself? The female wasps are generalist hunters of spiders, and spiders can be found everywhere as well. The wasp first finds a place to build her nest, usually in a sheltered situation such as beneath a rock overhang. Once she establishes a suitable location, she flies off to a patch of mud and rolls up a ball with her jaws and front legs. She then flies off with this pea-sized load and plasters it to the construction site she chose earlier. Once she has laid down a layer of mud on the surface of the substrate, she begins fashioning a three-dimensional cell. Each subsequent load of mud makes a “rib” that reaches across half the span of the cell she is building. The arcs from either side meet at the middle, dovetailing nicely with each other and the adjacent ribs on the same side. Once the cell is completed, leaving an opening at one end, she may plaster more mud over the ribs, obliterating the initial artistic appearance of the cell. A finished cell is then provisioned with paralyzed spiders captured by the wasp. 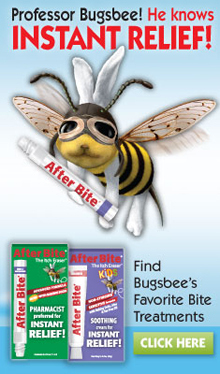 She uses her sting to subdue her prey, but does not kill it. A comatose spider won’t spoil before her larval offspring has a chance to feed on it. Many spiders are harvested and packed into the cell. The wasp usually lays an egg on the first spider to go into the cell. Orb weavers and crab spiders seem to make up the bulk of prey, but the wasps are opportunists and will not hesitate to take other kinds of spiders. Most female mud daubers make more than one cell, the next one placed immediately beside the previous one. The whole series of cells may then be covered in mud, making it look like some mischievous teenager hurled a clod onto a wall. Not very pretty, but an effective fortress against parasites. And do mud daubers ever have parasites! Chief among them are the cuckoo wasps of the family Chrysididae. These little metallic jewels wait for the hard-working mud dauber to go off on the hunt again, then enter the nest and lay an egg inside. Should the mud dauber catch the intruder, the cuckoo wasp roles into a tight ball, its dense cuticle impervious to the stings and bites of its irate host. Chrysis angolensis is an African species now well-established in North America, but there are native species that attack the mud dauber, too. 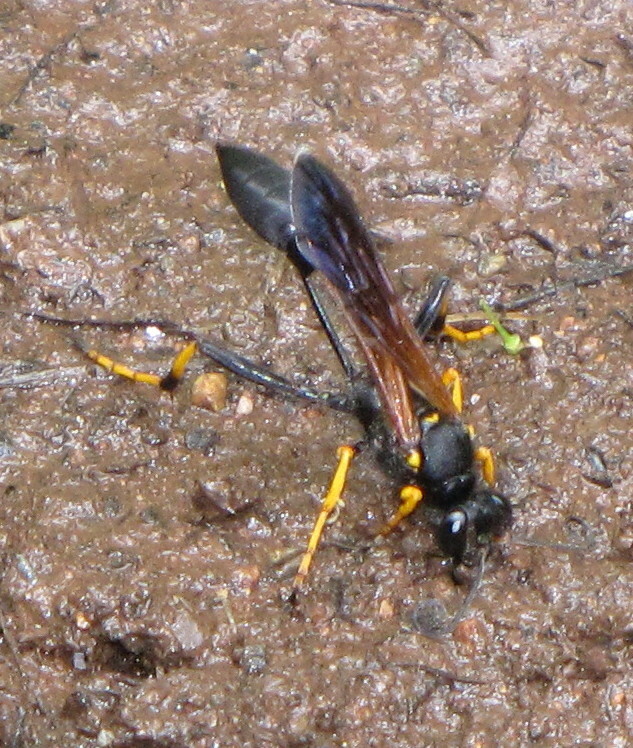 Other enemies of the Black and Yellow Mud Dauber include ichneumon wasps in the genera Acroricnus and Osprynchotus, as well as chalcid wasps in the genus Melittobia, velvet ants in the genus Sphaeropthalma, and bee flies in the genus Anthrax. 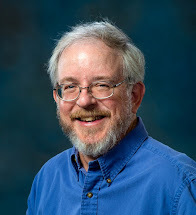 “Satellite flies” in the family Sarcophagidae, genus Amobia, are also a threat. Look at an old mud dauber nest and you can decipher what happened to the offspring. A large hole chewed out at the end of a cell means an adult mud dauber successfully emerged. Small holes along the length of the cell mean some kind of parasite came out instead. Once the new generation of wasps have emerged, the nests can serve as shelters for other insects or, ironically, retreats for spiders. 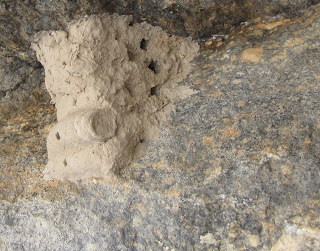 Other wasps use the ready-made mud cavities for their own nests. Mason wasps like Ancistrocerus tuberculocephalus will partition an old mud dauber cell into at least two cells of its own. Carpet beetle larvae will clean up any old spider and insect parts left over from all the tenants, and eventually the old nest may weather away, or be torn up by a mammal hoping for a juicy wasp larva snack. 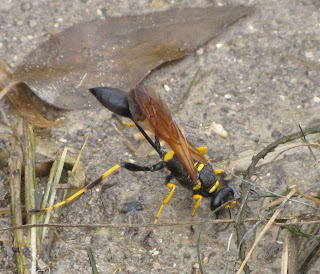 It is impossible to address the many fascinating aspects of mud dauber biology in a single blog, so expect me to revisit this species in the future. Meanwhile, go see if any mud daubers have been busy on your own property. Chances are, they have been. Beautiful wasps. 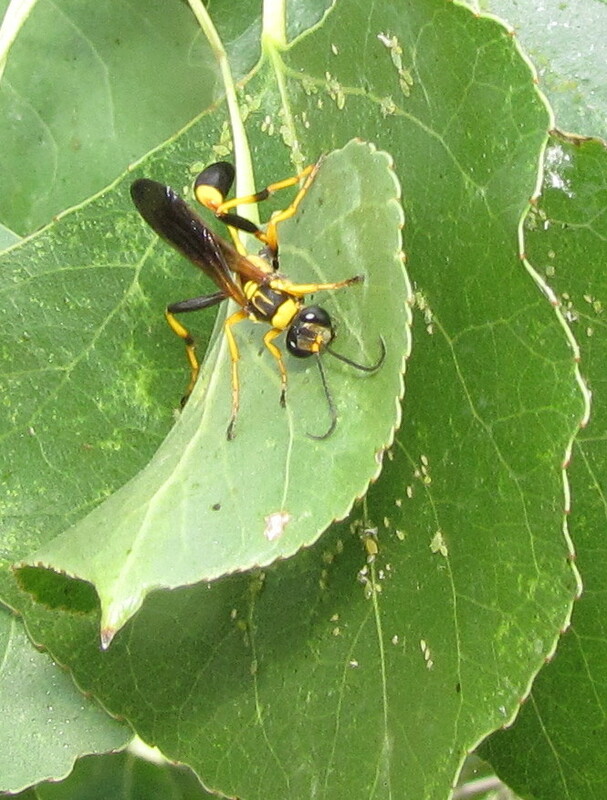 We have the Black Mud Daubers in our yard, they seem to like many of our prairie natives. Their backs get covered in pollen. Thanks for the mud photos, I believe I have a potential mud dauber mud nest in the corner of a shutter on the house. It's been there a few years, some openings appeared in the spring, and these have been mudded over - maybe by a different species. It's easy to see the new and older mudded areas by color. Now I'm going to have to inspect it more closely. I found two of these nests attached to my RV's air conditioner fan. When I turned the unit on there was a helluva racket! I figured I had to replace the unit. Removed these mud huts and was shocked at how many spiders I found in one of the cavities. 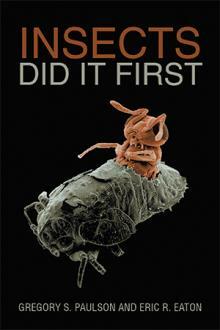 No less then thirty spiders crammed in the cavity with one maggot looking thing wiggling around. I bought the motor home out of Michigan and it was used extensively in Florida. I use it primarily in Idaho. I live in Calgary Alberta does this wasp live up here or did I bring them back into Canada with me? Sincerest apologies for the delay in replying....The species should occur in Calgary. I have a photo I just took of 3 black and yellow mud daubers, looks like maybe a queen on bottom and on her back a slightly smaller one with yet another on it's back. Seems th eonly connected parts are their heads. What in the world are they doing? That would be a female on the bottom, and two males competing to mate with her. 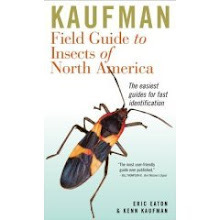 Mud daubers are solitary, so there is no "queen." Each female makes her own nest. Welcome Birds & Blooms Readers!